A steep descent leads to impressive views of the widest and most colorful part of the Grand Canyon. Note: There is no water along the trail; make sure you fill water bottles before arriving. All hikes into the Grand Canyon begin with a steep descent, and this one is no different. From the parking area, walk south down the paved road for a few hundred feet. The trail starts on the left (east side) near the trail board, with the gravel trail curving into an immediate descent. Switchbacks cut through Kaibab Limestone, and piñon and juniper trees dot the slopes. Enjoy the morning shade while it lasts — most of this hike is exposed and in full sun. You stay on the east side of a developing gully for more than a quarter mile, following the narrow and eroded trail. Hiking poles help you navigate this steep, loose upper section. You reach Coconino Sandstone where the trail crosses over to the west side of the gully. Cairns lead you down past a rock slide, in a continuing steep descent. When the trail levels briefly around 0.65 mile, you've dropped nearly 1,300 feet — three-quarters of the total elevation loss for this hike. Resume your descent on the west side of the drainage, reaching the Seventyfive Mile Creek — Tanner Canyon saddle near 1.5 miles. Bask in the phenomenal inner canyon views, and if you’d like to shorten the hike, this is a good turnaround point. 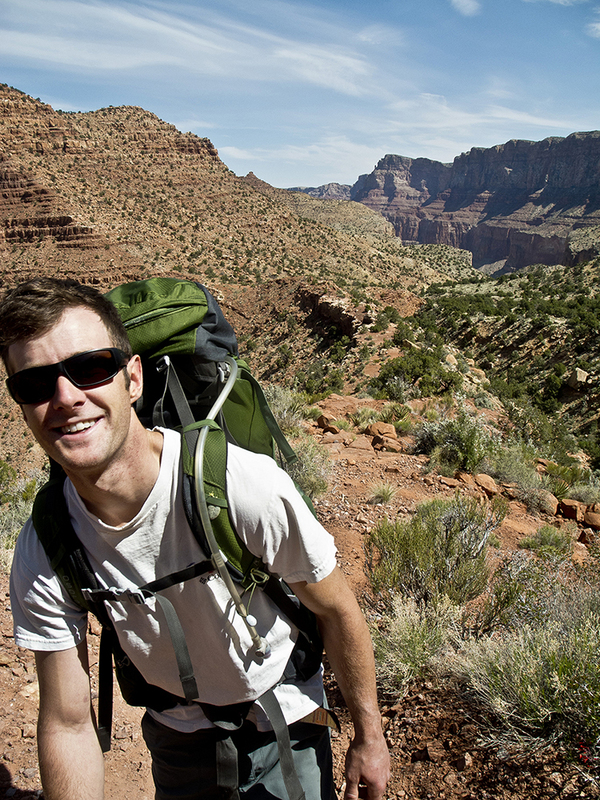 Past the saddle, enjoy flat, easy walking as you contour along the Supai Formation past the base of Escalante and Cardenas Buttes. The Desert View Watchtower is visible high on the opposite canyon rim. Around 3 miles, you crest a small ridge and continue north towards the Colorado River. For the next half mile, the trail contours along the top of the Redwall Limestone. Stay straight where the trail turns right and ignore the switchbacks that lead down into the Redwall. 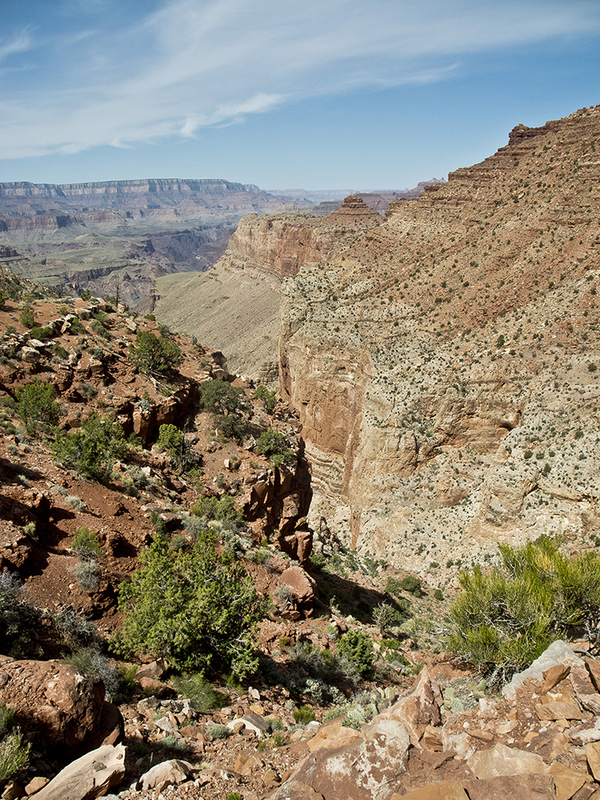 Walk a few hundred feet farther north, reaching a perfect picnic spot with views of the widest part of Grand Canyon. 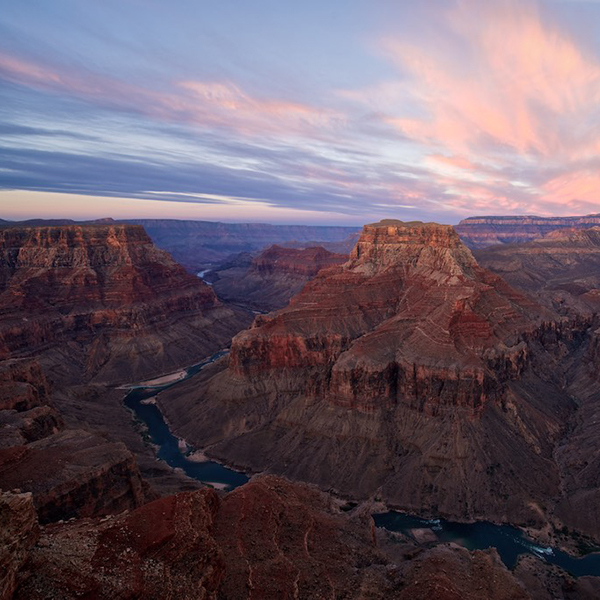 Upstream, the sherbet-colored cliffs form the Palisades of the Desert, and down by the Colorado, the canyon opens into rolling red hills of the Grand Canyon Supergroup. Known more commonly as Furnace Flats, this section of the canyon gets exceptionally hot. For a 7-mile round-trip day hike, return the way you came. Otherwise, press on toward the river. Take your time picking your way down the Redwall switchbacks — the grade is steep, exposure high, and rock loose. The trail swings around to a small saddle before descending through the greenish-purple Muav Limestone, but you end up losing some of your precious downward progress as you contour around drainages and climb up to a flat-topped ridge. Your knees will appreciate the brief break in grade as you follow the ridge north toward the river. A few remaining switchbacks drop you into the deep red Dox Formation, and from here, it’s a steady traverse all the way to the bottom of the canyon. (Note: The Park Service has done quite a bit of trail work on this section of trail). When you reach the sandy wash floor, follow it downstream to end at Tanner Rapid. 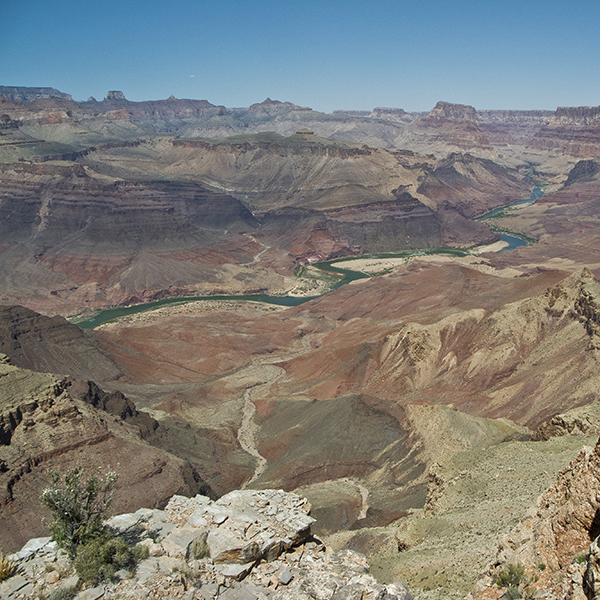 Tanner Trail starts at Lipan Point, one of the park’s scenic overlooks along Desert View Drive (Hwy 64). You can access it from either entrance station on the South Rim. From Grand Canyon Village, drive 23 miles east on Hwy 64, or from the junction of Hwy 89 and 64 at Cameron, Arizona, drive west on Hwy 64 for 31 miles. 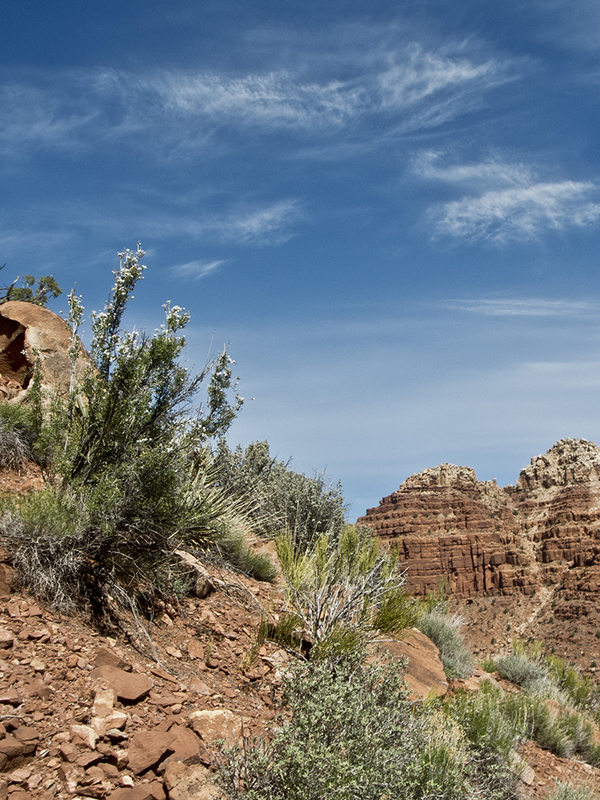 Turn at the signed road to Lipan Point, and drive a short distance to the looped parking area. Fee required – Fee required. 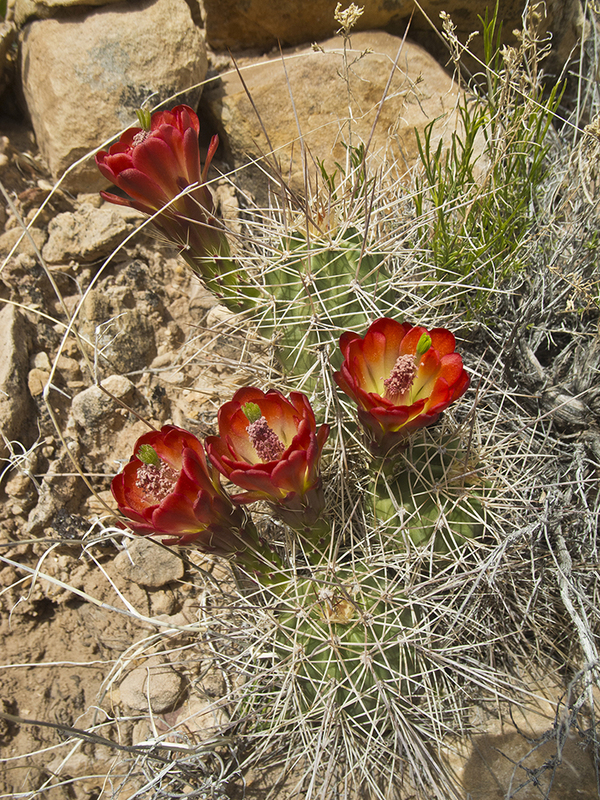 Camping below the rim requires backcountry permits and additional fees. See website listed below for current information.